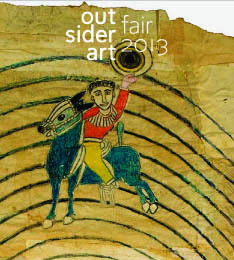 The Outsider Art Fair - under new ownership and at a new location in New York, previews on Thursday January 31. The Fair will then be open on Friday until Sunday. Quality galleries such as St Etienne, Carl Hammer and Ricco Maresca will be returning this year. A vetting committee has also been established consisting of Shari Cavin, Andrew Edlin, Carl Hammer, Jane Kallir, Frank Maresca and Randall Morris. The collage drawings of Bruce New. 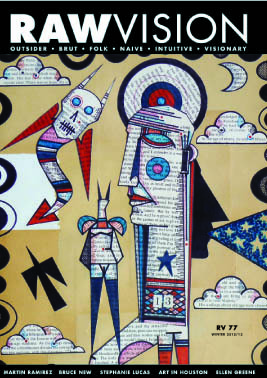 A reassessment of the work of Martin Ramírez. The strange kid leather gloves of Ellen Greene. John Devlin's utopian academic world. Creative expressions found in Houston, Texas. The dream machines of Ian Ward. Plus reviews of exhibitions and books and news of outsider events and exhibitions around the world. Click here for a page-turning preview!